Of the many world-class facilities for which Chicago is renown, the Fermi National Accelerator Laboratory is in a class by itself in the world of high-energy particle physics. That is why when the roof of the facility’s Meson Detector Building began to leak again, it is no surprise that the solution to the problem was also a high-tech. 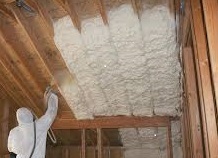 Spray foam insulation Chicago was the solution that had eluded other contractors over the course of the previous 40 years. The roof consisted of concave metal panels which befitted the architectural design of the facility. Its unique look contributed to the constant leaking because of ever-present puddles that formed and allowed water to seep through metal seams. The roof and the structure became a local joke and an example of government inefficiency. The Department of Energy, this last go-round, was looking for a more permanent solution that did not require secondary roof structures inside the building – the stop-gap solution that had been employed for four decades. Several idiosyncrasies of the roof made the installation of foam insulation on this roof particularly difficult. The metal structure itself was slippery even when it wasn’t wet. The sloping, curved shape of the roof sections was also a problem in that secure and stable footing for work crews was not consistent. Imagine foam crews repelling down the half-pipe roof sections across the entire length of the building to reach each section and you will have an idea of the difficulty of the application process for this project. What was not a problem is adherence. Spray foam adheres to most any surface – even metal panels that had been exposed to weather extremes for more than forty years. The extreme insulative properties that are unique to spray foam (spray polyurethane foam or SPF) filled in all the gaps that were causing the leaks when the metal roof components expanded and contracted. Foam also eliminated the condensation which formed every winter on the inside of the roof which posed walking hazards for technicians and research scientists working below. The entire roof space amounted to just over 40,000 square feet. To preserve the architectural look of the facility, foam was specifically formulated for this project to match the existing metal colors of terra cotta and blue so that, from a distance, there would be no visible signs that the building roof had a foam coating. Your residential or commercial spray foam project might not have the size or logistical difficulties of the Fermi Lab project, but it is good to know that if spray foam could solve a forty-year old leakage problem in this Chicago icon, then your project will be well served by using spray foam. Whether you have need of roof insulation, basement insulation, crawl space insulation or are looking to soundproof a movie room in your home, know that spray foam is the high-tech solution that will solve your problem once and for all. Give us a call today to see how spray foam can help make your space more comfortable, energy efficient and save you money every month on utility bills.